We live in a highly complex and volatile age. There is a deep spiritual poverty within humanity – they are spiritually lost and confused souls. Art is not merely a record of life and its activities, but is also a valuable form of spiritual healing. Mind, body and spirit might sound like a mantra for a Yoga ad. Mind, body and spirit, may well be the last pursuit for many. Nonetheless, the completeness of Being seem to be encapulated by Li Chen’s body of work. Rounded forms, perched on granite plinths occupy the greenery of Singapore Management University, as part of an exhibition by Li Chen. The curious arrangement is somewhat sporadic, scattering rather than concentric like other sculpture parks that consider the environment. 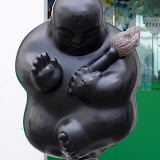 Some people will agree with me, that the works by Li Chen, resembles an Asian Botero in stone, instead of bronze. Others will argue that the spirituality embodied by these works transcend comparison with Fernando Botero’s ‘large’ sculptures, or obese form. By this comparison, we seem to be arguing whether it is important the Italian’s discovered or imported Spaghetti. Our own interpretation of the work may be more important than the provenance of the artist’s inspiration. Questioning our fulfillment of seeing curvaceous, rounded sculptures, against the representation of the Laughing Buddha (弥勒佛) for its posterity, or the Venus of Willendorf (c. 24000B.C. – 22000 B.C.) might reveal a cultural preference for the voluptuous form. In a primal mindset, the full body represents prosperity or fertility, while thinness represents malnourishment and neglect. In that light, the sculptures of Li Chen reflect the pursuit of fulfillment, symbolically, ballooning with inner peace, invigorating and uplifting.